American actress Amy Aquino is one of the stars of Amazon’s hit series Bosch. 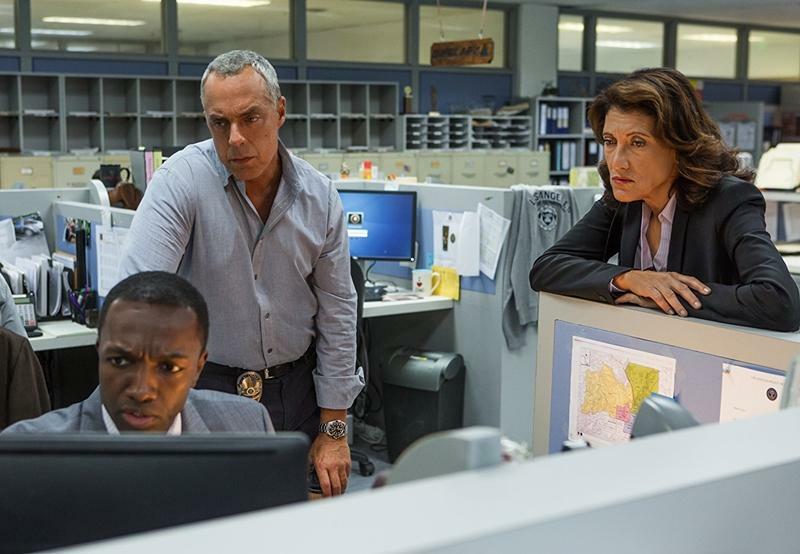 On the show, she plays Lt. Grace Billets, the immediate superior of homicide detective Harry Bosch, played by Titus Welliver. Previous to Bosch, Amy has appeared in numerous successful television series such as the critically acclaimed Brooklyn Bridge and she has had recurring roles on Glee, Curb Your Enthusiasm and ER among many others. In a new exclusive interview for our site we’ve been able to chat with her about Bosch’s latest chpater. The show’s fourth season was released last April 13th. Don’t miss it! Click here to check out the interview in Spanish. – Hi Amy. Bosch’s foruth season was just released a couple of months ago. For people that haven’t watched it yet, what’s the new story about? Based on the book Angel’s Flight, this season starts with the murder of an African-American attorney the night before he’s to take the LAPD to court for the torture of an innocent civilian. The city is enraged, and in an effort to avoid a riot Irving appoints Bosch to lead a Task Force to get to the bottom of the crime, even if that leads back to his fellow officers. Meanwhile, Bosch continues his quest for his mother’s killer, and has to deal with yet another personal loss. – What’s in store for Grace in this new chapter? Grace is in a tough place. Having been passed over for a promotion to captain last year, this season insult is added to injury when Irving appoints her temporary Captain of the Hollywood Division just as protests are fomenting and violence being threatened. It’s a thankless job that puts her at odds with her colleagues at the station. – What about your Grace’s relation with Harry? What would you highlight about its evolution and what’s coming next? – As the commanding officer of the LAPD Hollywood’s Division, we don’t see your character get much real action on the show. Would you like to see Grace on the field more? Grace knew when she made Lieutenant that she would be spending less time on the front lines, but she really enjoys helping shape and direct her detectives’ investigations. This year, however, the murder task force is reporting not to her but directly to Irving, and it’s frustrating for Grace to be kept in the dark. – What can you tell us about the experience of portraying a LGBT character on television? I think we’re at a place in America where it isn’t much of an issue. It doesn’t define Grace, it’s just one aspect of who she is. I think that’s why some viewers, including my friends and family members, were so surprised when I made the move on Rose Rollins in season one. Of course, Rose was so lovely I didn’t need to be gay to want to kiss her. – Do you know anything about season five? When do you start production? They are still figuring out season five, and I’m as interested in finding out about it as you are! We generally shoot from August through November, finishing right before our big holidays. – Amazon Prime Video arrived about a year ago in Spain (our country) so shows like Bosch are new to a lot of people. What would you say to anybody that is thinking about starting to watch? Originally a reporter covering crime in LA, Michael Connelly has been honing the character of Harry Bosch for over two decades. He’s one of the world’s most widely read crime writers, and with good reason. Our show is rich in detail, and meticulously realistic about the world of law enforcement. It also provides a fascinating look at the real Los Angeles, taking viewers into neighborhoods and elements that are rarely, if ever, showcased. – Before we finish, are you working on any other projects right now? I’ll be appearing with Steve Carrell and Maura Tierney in the feature film Beautiful Boy to be released later this year. I also love going back to the theater on my break, and am doing Wendy Wasserstein’s play The Sisters Rosensweig in Los Angeles right now.